Advent is a time of waiting, expectation, and preparation for the birth of Jesus Christ, the world's savior, on Christmas Day. During Advent we are also called to prepare for His coming into our hearts anew at Christmas. 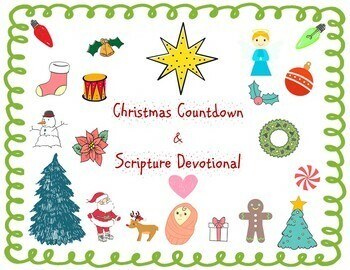 This kit can be used as a Christmas countdown and a method of reviewing the Christmas story. The last five symbols tell the story of the very first Christmas night! 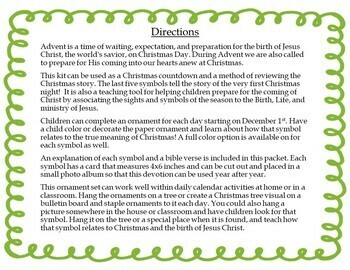 It is also a teaching tool for helping children prepare for the coming of Christ by associating the sights and symbols of the season to the Birth, Life, and ministry of Jesus. Children can complete an ornament for each day starting on December 1st. Have a child color or decorate the paper ornament and learn about how that symbol relates to the true meaning of Christmas! A full color option is available on for each symbol as well. An explanation of each symbol and a bible verse is included in this packet. Each symbol has a card that measures 4x6 inches and can be cut out and placed in a small photo album so that this devotion can be used year after year. This ornament set can work well within daily calendar activities at home or in a classroom. Hang the ornaments on a tree or create a Christmas tree visual on a bulletin board and staple ornaments to it each day. You could also hang a picture somewhere in the house or classroom and have children look for that symbol. Hang it on the tree or a special place when it is found, and teach how that symbol relates to Christmas and the birth of Jesus Christ. When printing, select FIT or Shrink Oversized pages to ensure graphics are printing within the page margins.